Phillip Hughes was the victim of a "freakish" injury that left him with little chance of survival, Australia team doctor Peter Brukner has said. Brukner said Hughes, 25, died as a result of a vertebral artery dissection, which caused a "massive bleed" on the brain. "Vertebral artery dissection is incredibly rare," Brukner told media at St Vincent's hospital in Sydney. "There is only one previous example caused by a cricket ball." Hughes was struck on the top of the neck by a short-pitched delivery on Tuesday while playing in a domestic match and died in St Vincent's hospital on Thursday having never regained consciousness. Hughes had been wearing a helmet but the ball struck him at the base of the skull, causing the injury. "Phillip took the blow at the side of the neck and as a result of that blow his vertebral artery, one of the main arteries leading to the brain, was compressed by the ball," Brukner said. "That caused the artery to split and for bleeding to go up into the brain, and he had a massive bleed into his brain. "This was a freakish accident because it was an injury to the neck that caused haemorrhage in the brain. "If you look in the literature there are only 100 cases reported." Such injuries are frequently fatal at the time, but Hughes was resuscitated on the field and taken to hospital in a "reasonable condition", Brukner added. 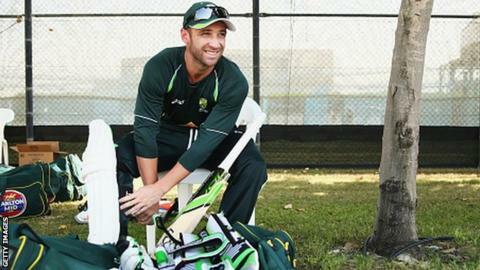 Hughes had a 90-minute operation to relieve pressure on his brain but he failed to regain consciousness. "The head injury he suffered was catastrophic," Tony Grabs, director of trauma at St Vincent's, said. "He went to theatre and had extensive surgery to remove some of the skull around his brain to help allow the brain to expand so it wasn't compressed. "Over a period of the first 24-48 hours, as we know, he did not make very much improvement and unfortunately as a consequence of the injury he died."